With progress in natural marine aquarium keeping, increasing numbers of so-called "starfish" successfully reproduce. Applications like deep sand beds and refugium habitats seem to support such success. Some species may become a nuisance by their sheer numbers and prolific nature like Asterina, while others are clearly harmless or helpful by stirring detritus or consuming algae, for example. This article covers a range of sea stars kept in aquaria, including the deliberate and incidental imports, the decorative and nuisance, or predatory, ones alike. 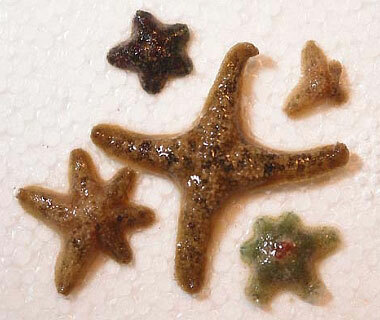 The proper care of sea stars has long been an area of the hobby in need of improvement. It pains me to see fellow aquarists innocently add these animals to variously themed tanks with hardly a thought for what these creatures eat or need to survive. Many folks assume that "starfish" are simply deposit feeders that will somehow find what they need by grazing about the tank. 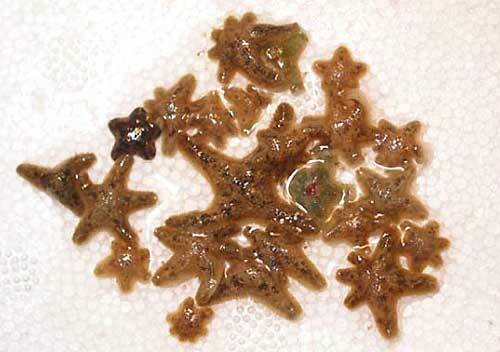 In fact, very few sea stars can live wholly on the incidental matter that grows or collects in aquarium systems. Moreover, very few aquariums are even capable of growing enough food matter, by weight, to sustain even a single Asteroid (more about classes and groups below). In traditional "garden reef keeping," most of us strive to limit nutrients and nuisance algae by underfeeding and the use of skimmers, other grazers (such as Turbo snails, tangs, and urchins) and the cultivation of dominating coralline algae species. This tends to produce "lean" rocks and sand without much soft matter for a sea star to graze upon. In aquariums where suitable food matter does grow for surface-grazing sea stars, insufficient surface area, and hence food, per starfish is oftentimes a limiting factor. Undersized aquaria or overstocked tanks will not produce an adequate supply of potential food matter. The sobering reality about sea stars is that many slowly starve to death within a couple of years, if not mere months, of importation. Making the matter worse, a significant number of collected stars do not survive the importation process to reach a consumer's tank. To be clear, I do not mean to criticize the keeping of sea stars at large. Rather, it is my intent is to acquaint fellow aquarists with some potentially surprising realities about the collection, handling and keeping of these fascinating animals with hope for a more conscientious and responsible use of this group. 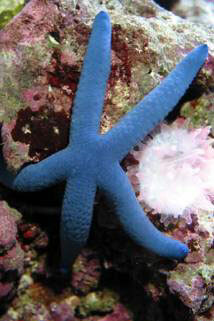 The beautiful Blue Linckia sea star is perhaps the best known and most popular and sought after variety. They have rather poor rates of survival with aquarists. Most folks tend to do quite poorly with individuals of this species, exacerbated by sensitivities in shipping and handling. For best success, buy these creatures only on sight and after at least five days of acclimation (stabilization) to a dealer's tank. After that, it is advisable to stock them in mature aquaria with aged live rock and few other grazing fishes or deposit feeding invertebrates. A good rule of thumb is a maximum of one Linckia laevigata per 100 gallons. Ask yourself when making decisions, particularly about unfamiliar or notorious livestock for your aquarium, "Do I have an adequate understanding of its needs?" Are you likely to succeed in keeping it for its potential natural lifespan? Do you currently have the means (adequate tank size, age and continuous food source) for keeping it, and not merely the hope of improvement, such as a bigger tank, one day? There are other ways to contemplate such purchases; such as, "Is my purchase a conscientious use of this animal?" Now the definition of what is conscientious use is, to some extent, subjective. But without hiding behind the guise of an infinite amount of "what ifs" or superlative claims and demands, we should be able to agree on the fundamentals, much like the citizens in a commonwealth collectively agree on laws that are "reasonable" to the majority of a given constituency, which all obey for the greater good. Let us simply begin then by addressing that which we could agree is sustainable harvest, from the perspective of empathetic aquarists that regard the life in our tanks as something more than a mere commodity. At least several species of sea star (including common Protoreaster species), from both tropical and temperate waters, are imported under the common name 'Chocolate Chip Starfish.' They tend to be categorically risky as predators in the long term for tanks with mixed reef invertebrates. They often suffer severe rates of mortality upon importation. It is their low price that perhaps contributes most to the continued popularity of, and tolerance for, these varieties, despite their dubious behavior and suitability for casual keeping in community tanks. let us also not forget the predatory feeding habits of Ophiarachna incrassata, the infamous Green Brittle Star that sits with a fishing pole and drinks beer while listening to country music. Indeed, the feeding habits of "starfish" at large vary widely and it is imperative that aquarists understand their specific animal's needs in advance. Ophiarachna incrassata, the infamous Green Brittle Star, and a few related kin are the rare exceptions to the otherwise reef-safe and well-behaved Ophiuroid serpent and brittle starfish class. In some tanks O. incrassata will behave for months or even years, while in other tanks they tend to catch and kill motile creatures whenever possible They are active predators, which arch their central disk above their legs to form a trap for fishes and other prey. A lurker pictured here. whoever 'they' are. And so, the case I put forth to you is that with so many other hardy and beautiful creatures available, why use any species of dubious value or questionable sustainability? 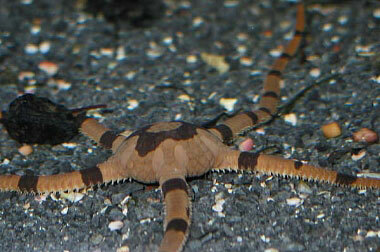 For example, the sale of live "feeder starfish" as prey for the beautiful Hymenocera Harlequin shrimp is not uncommon. This shrimp has long been believed, at least in popular literature, to feed only on the tube-feet of certain sea stars. As an aside, they have been observed, anecdotally but often, to actually feed on other echinoderms and other parts of these various animals. 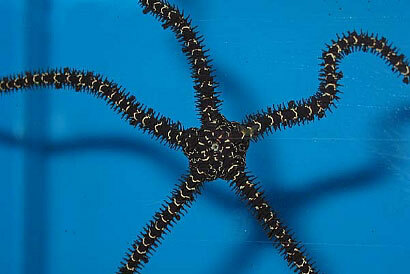 Within the genus Asterina are one or more species of stars that are prolific in reef aquaria. They usually appear accidentally and have been cultured by aquarists to feed Harlequin shrimp as an alternative to wild-harvested sea stars. Merchants and aquarists may not know of, or may choose to ignore, these other options, though, and rationalize the sacrifice of wild-caught specimens with a claim of light usage, of say - one large wild-caught star per month. The popular imports, however, suffer remarkably high morbidity and mortality just to funnel one healthy live starfish down to the merchant. So we must ask ourselves, how many specimens can be permissibly sacrificed in transit to successfully fill one order: one, two, ten, or more? None need be sacrificed, in my opinion, when Asterina is an easy and available home-grown alternative. Even if such options did not exist, we still would have to practice responsible use of wild-caught species. Losing several dozen collected stars annually to provide one live one per month as a "feeder" is not conscientious from my perspective. In such matters, let us not forget the hard lessons learned by our fellow aquarists in Europe: if you do not adequately police yourself, someone else will do it for you! And it should not take government or legislation to get us to make sensible, if not empathetic, buying decisions like this. 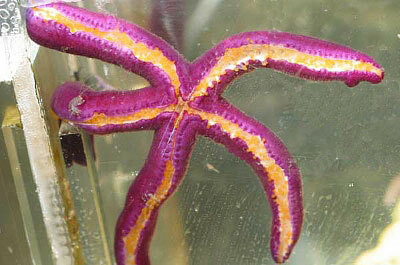 Although sea stars like the aforementioned blue Linckia and this Purple Leiaster (pictured here), have shared reputations for their gross similar appearance, the reality is that their survivability often differs substantially. Because this purple species is far less common in the trade, and therefore more valuable, they tend to get handled better with larger bags and more water in transit. Subsequently, they may enjoy higher rates of successful establishment in captivity. Aquarists should use such insight to strategically select species that are better choices in the long run for both themselves and the hobby. Common and so-called "fancy" Ophiuroids like this banded species are available from Florida. They are hardy, ship well and live long once established with modest but faithful husbandry. Feed small amounts of mixed green and meaty foods several times weekly. A fine scavenger for beginners and newer aquaria that are regularly fed. 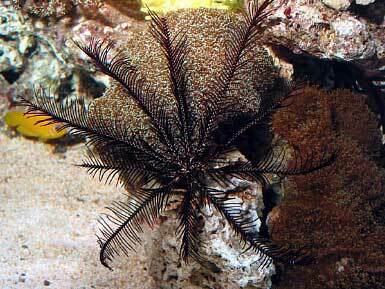 Ophiuroids - Serpent Stars: with the exception of basket stars (see overview of Crinoid feather stars below as similarly challenging), the majority of serpent and brittle stars are hardy and suitable for home aquarium life. Many will fare well even in smaller aquariums (under 20 gallons), provided that they are target fed at least weekly. Most are harmless, if not helpful, in reef displays as innocuous bio-turbators (sand-stirrers), eating particulate matter or at least keeping it in motion or suspension for nutrient export processes such as skimmers and mechanical filters. They are the least discriminating and most adaptable feeders of all "starfish." Unlike other popular clean-up creatures (hermit crabs, perhaps most notoriously), Ophiuroids are only a light burden on the bio-load and bio-diversity of the system. Numerous species in this class are suitable for beginners. Species native to tropical Florida waters are highly recommended for aquarists for their utility and ease with which they can be successfully collected and shipped to aquarists in the United States - short transit time, frequent direct flights to distributors, and hardy by nature once established. 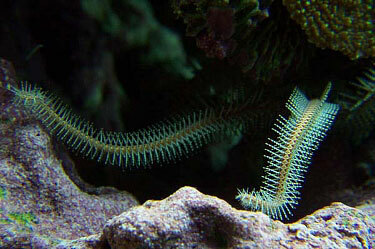 Even ornate Ophiuroids tend to be hardy and long-lived once established in reef aquaria. They enjoy rocky habitats and will usually accept a wide variety of foods. Crinoid - Feather Stars and Sea Lilies: there is very little to discuss here regarding this extremely challenging class of organisms. I won't even pay lip service to the noble charge, "If an advanced aquarist works hard enough and sets up a species-specific system just for [Crinoids], there is a chance of success." Point blank: please do not keep or encourage others to keep these creatures at this time. Why? You may ask. It's a fair question, indeed. Sadly, the overwhelming majority of specimens will perish within weeks or months of collection. They are notoriously delicate and weak shippers. Their dietary needs are poorly understood and difficult, if even possible, to meet in aquarium systems (i.e., steady supplies of enough of the right kind and quantity of plankton, bacteria, etc.). The few specimens out of hundreds that do survive six months or more in captivity simply do not justify the collection of so many others, which die to pave the way for the arrival of each live one. This is one of those groups of reef creatures for whom we must step forward and make a conscientious choice not to support the collection of for casual keeping or impulse purchases. To any aquarist that disagrees with this position, I respectfully ask him to soberly consider the effect that the promotion of keeping such species to the masses does, and to kindly document, if possible, any unique successes of several years or more with Crinoids, rather than simply reporting specimens that took 6, 12 or 18 months before finally starving to death. Asteroid Sea Stars - classic body "Starfish": without stepping down completely from the anti-Crinoid and anti-Basket Star soapbox, I come to perhaps the most underestimated class of sea stars, the Asteroids. While many aquarists will agree that Ophiuroids are generally hardy and easy to keep, and that Crinoids are difficult to keep, the classic Asteroid "starfish" species are largely mishandled and often suffer very badly for it. Species from this class often carry the erroneous reputation of being good scavengers (like Linckia species) that magically live off of whatever organic film happens to be growing in the aquarium, assuming that beer nuts and salty pretzels are not available to eat instead. Unfortunately, some are so remarkably inexpensive to import for sale that consumers can buy one weak and dying specimen after another with little incentive (beyond ethics) to stop and consider the suitability of the species or source for aquarium use. Alas, this class includes many of the most beautiful sea stars known to man. All is not doom and gloom, however, for keeping Asteroids. Unlike filter-feeding crinoid and basket stars, most of the difficult Asteroid species are not inherently challenging to keep alive. Given an appropriately constructed set of physical parameters in the aquarium, and a healthy import, many Asteroids can be kept with relatively little effort. They do, however, require specific care. Most are carnivorous and target specific prey that may not exist or be adequately produced in aquaria to sustain them (particularly smaller aquaria). Most species in this group are not "reef safe." A small but steady stream of larger, novelty Asteroid sea stars seems to always trickle into our hobby. Some of these pillow, pincushion and bat stars for example are highly predatory, require uncommon amounts and frequencies of food, and are generally unsuitable for any but the absolute largest home aquaria (over 300 gallons), like this temperate cnidarian predator, Dermasterias imbricata. 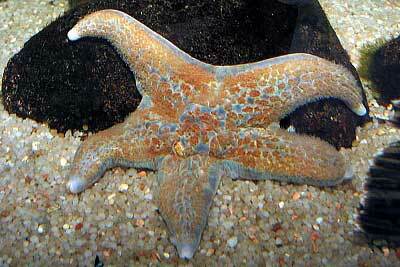 It's easy to underestimate the need for small frequent feedings (three to five times weekly) in a sea star's diet. It's even easier to underestimate the need to target feed these creatures at all. We must consider the not-insignificant size/weight of a medium sized "Chocolate Chip," "Red African," or Blue Linckia starfish, for example, which is many times the mass of some popular reef fishes that eat routinely. The size of these animals also causes serious problems without proper quarantine (QT) when a sick or dying specimen crawls into an inaccessible crevice of the rockscape and begins to decay. It's not hard to imagine what a comparable mass, like a 4 oz. package of frozen meat or a large can of food pellets, poured into the tank and left to rot would do to water quality in mere hours. QT is not only for disease control, but also for screening for incidental pests and predators carried in (flatworms or predatory snails, for example) and the simple, controlled acclimation of stressed, newly imported specimens under close supervision. We should also take some time to consider what is "reef-safe" among new candidates. To anyone with more than just a little experience as an aquarist, the reality of what defines "reef-safe" is better-appreciated. Ultimately, there is no such organism from a wild reef, for display in your reef tank that is purely "reef-safe." Put another way, everything on a reef eats something else on the reef! Thus, the definition of whether a given organism is "safe" or not for your tank truly hinges upon whether or not you personally like or dislike whatever it eats. To illustrate this point, to the aquarist with a dreadful nuisance algae problem, an urchin mowing through the tank eating hair-, macro-, and coralline algae is like is a blessing. To another aquarist without hair algae, simply losing his corallines or desirable macros to the urchin, the grazer may be deemed "not safe." 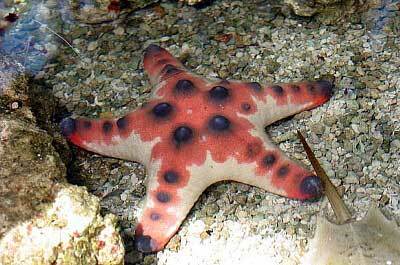 Asterina sea stars have been accused, unfairly at times, for preying on coral tissue. While some individuals appear to eat some desirable reef invertebrates, the problem may be a simple matter of an opportunistic predator adapting to a change in the available, preferred foods (worms, algae). Returning to our example of the common, small Asterina species found in some reef tanks, these sea stars in recent years have suffered, unfairly I might add, the reputation of being risky or just plain un-safe in the reef. This is interesting because for many years prior to that, they were not only regarded as harmless, but beneficial! What happened? Did they all change their voter registrations overnight? No, the answer really is quite simple. It also explains why some other "controversial" reef invertebrates have contradictory reputations like Mithrax/Mithraculus crabs. Many such creatures are opportunistic feeders. While they favor one type of prey that is convenient or popular to us, like sand bed worms, brown diatoms or bubble algae, they will adapt to eating other food items following the reduction or absence of a preferred food item. Thus, the reef keeper with a persistent growth of microalgae in a garden reef display will likely have less trouble with misbehaving omnivores than another aquarist with an aggressively skimmed and scrubbed tank that supports little growth of the matter. In a phrase, the hungrier that a so-called "reef-safe" creature gets, the less "reef-safe" that creature becomes. In the case of Asterina, many years ago during the bare-bottomed, nutrient poor Berlin style era of reef keeping, reef husbandry with early protein skimmers and limited nutrient export processes was not as efficient as it is today; diatoms and other nutritious growths grew quickly in our tanks. And Asterina were not considered un-safe by hobbyists. Identify the species, needs and suitability of a candidate before purchasing. Know the natural habits and habitat (soft substrates, hard substrates, opportunistic feeder, carnivore, etc.). Be strategic on selection: avoid impulse purchases, seek Ophiuroids among the most suitable stars. Avoid Crinoids, and resist keeping Asteroids casually or in young or smaller aquaria (less than 1 year old or <100 gallons per sea star). Quarantine all new acquisitions to screen for possible pests and predators, to acclimate and stabilize newly imported specimens in the confines of close quarters, and to concentrate feeding opportunities to establish a stronger specimen, spare the display from serious risks to water quality in case of a weak specimen dying in the recesses of the rockscape. Target feed most species several times weekly (smaller, more frequent feedings are always best). In conclusion, I simply wish to re-emphasize that most starfish we encounter in the aquarium trade are not so opportunistic, if even opportunistic at all, as to be able to survive in aquaria without special attention paid to their feeding and other husbandry requirements. By isolating new acquisitions, addressing special requirements, and not underestimating the needs and merits of keeping starfish in marine aquaria, we can significantly improve rates of survival and success with these fascinating creatures. Blake, D. B. 1981. A reassessment of the sea-star orders Valvatida and Spinulosida. - Journal of Natural History 15:375-394. Colin & Arneson. 1995. Tropical Pacific Invertebrates. Coral Reef Press. Beverly Hills, CA 90210. Kerstitch, Alex. 1989. Sea of Cortez Marine Invertebrates. Sea Challengers. Monterey, CA 93940. Sprung, Julian. Invertebrates - A Quick Reference Guide. Ricordea Publishing. Miami, FL U.S.A.
* Special thanks to the Reefkeeping Magazine editorial staff for suggestions and contributions to this article.